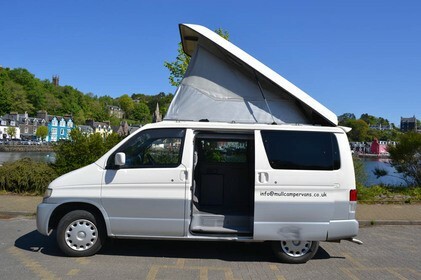 This page displays all the campervans that are available for hire in Argylleshire . If you would like further information or to speak to the camper's owner about hiring their van please visit their Camperbug page, by clicking below. I am Wee Bongo, hire me today! The van is compact, economical and easy to drive on the Isle of Mull\'s single track roads. Uses Diesel, Automatic 2.5L 4WD, Seats 4,Sleeps 4 in 2 double berths, (ideally one adult and one child sharing a double berth unless it is 2 adults who know each other very well)Pop UpTop,Twin Hob Gas cooker,Sink with running water,Fridge with ice box,Leisure Battery - you don\'t need power hook ups.